Minister for Public Works and Culture, Naeem Akhtar, today said Jammu and Kashmir has set new records in connectivity projects by surpassing the target under Central Road Fund (CRF) and other schemes meant for road expansion in the state.“Good roads not only connect people and places, but they also bring prosperity. Last year, J&K exceeded the targets set under various centrally sponsored schemes for upgrading old roads and building new ones. 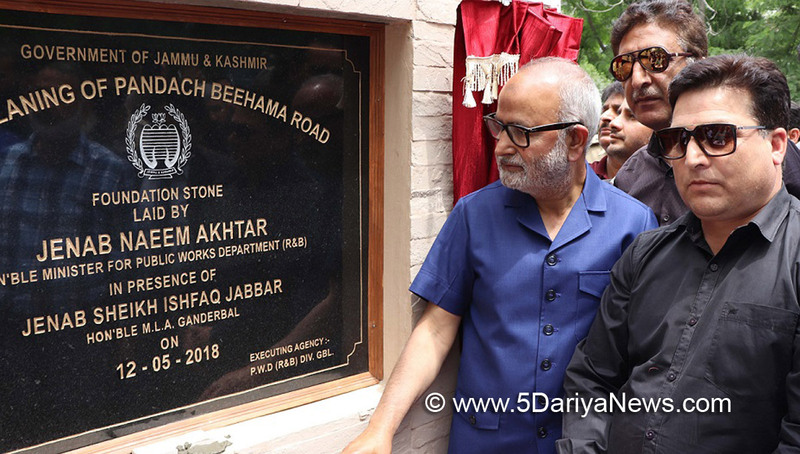 This has brought us into a position where we can seek additional funds from the Centre to give a boost to our developmental agenda,” Akhtar said.The Minister made these remarks while laying the foundation stone for four-laning of 3.75 km Pandach-Beehama road in Ganderbal, part of Srinagar-Ladakh national highway which will be developed under CRF. He said the project, a long-pending demand of people in the area, will be completed soon.Akhtar said the state government is contemplating to take up this year the construction of Wayil bridge, a crucial project which connects Ganderbal with Sonamarg and Ladakh. Presently, a single-lane bailey-bridge has been set up as a temporary arrangement which results in traffic snarls. The Works Minister said the Shalbug bridge, another important project for connecting Ganderbal with the capital Srinagar city, will be taken up under Central Road Fund this year on the demand of people, which will address connectivity concerns in the district.“The works department did exceptional work last year which has raised the expectations of the people. Road networks have undergone significant changes since our government came into office and people are looking forward to the continuation of your good work,” he said, while lauding the officers of R&B department for keeping pace with people’s expectations.The Minister said the state government will take up record length of roads under Pradhan Mantri Gram SadakYojna this year in Jammu and Kashmir which will help in socio-economic uplift of people living in far flung areas of the state.The foundation-stone laying ceremony was also attended by Member of Legislative Assembly, Ishfaq Jabbar, Deputy Commissioner Ganderbal, Piyush Singla, Chief Engineer R&B Department Kashmir, Nissar Ahmad Bhat, SSP Ganderbal, Fayaz Ahmad and other senior officers of civil and police administration of Ganderbal district.